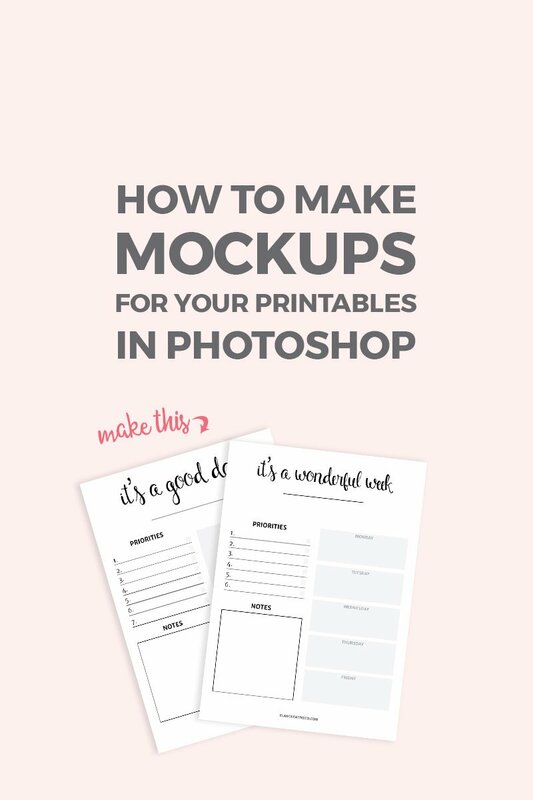 How to make mockups for your printables in Photoshop ~ Elan Creative Co.
Do you have a resource library full of printables? If you do, I’m sure you know that you need an attractive image to promote your freebies. There are many beautiful mockups that you can purchase and use, but you can also create your own templates. 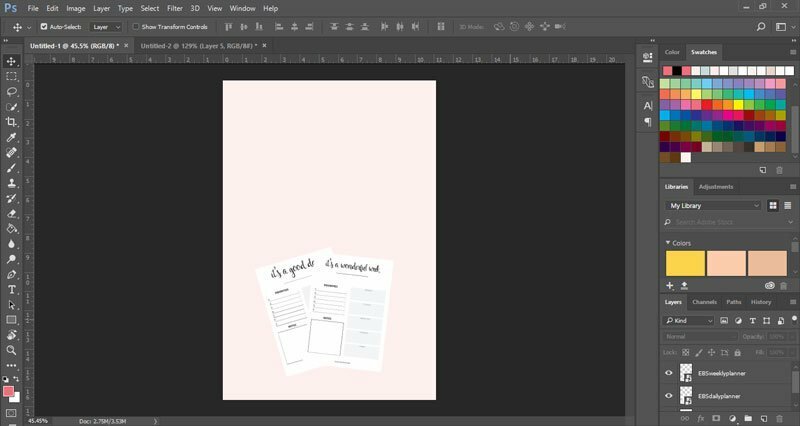 In this tutorial, I want to show you how to make mockups for your printables in Photoshop. You can do this using any design software you like, even Canva or Adobe Spark, but I use Photoshop and I think it’s the best software for creating mockups. 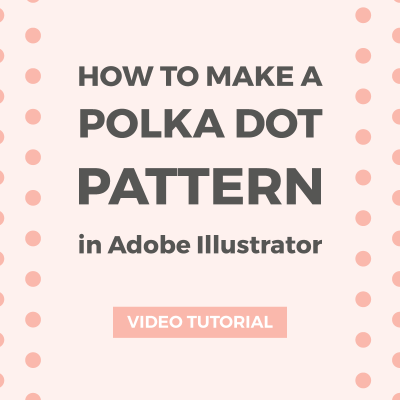 Please subscribe to my channel if you want to see more Illustrator and design tutorials. 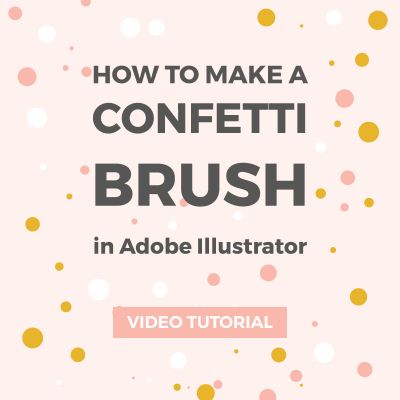 I release a new tutorial every other week. I want to create a pinnable image for this post, so I’ll start with an 800 x 1200px canvas at 72ppi. If your printables are white like mine, you should avoid using a white background. You can also use a photo or a texture that matches your branding. Once you have the document set up, just add your printables. Open your PDFs and save them as JPEGs or PNGs. If you don’t have the original files, you can open PDFs in Photoshop and save them as raster files (JPEG or PNG). Go back to your document and import your files using File > Place. You’ll notice that there’s a box around your image. You can use the anchor points to scale your image or you can move it using the Move Tool (V). Double-click on your image to place it. If you want to add more images, use the File > Place function again or drag and drop your image onto the canvas. My printables are almost as large as my canvas so I will scale them. If you have a photo background with objects like pens or flowers, make sure that your printables are realistic in proportion to them. To scale objects, select the layer you want to change and go to Edit > Transform > Scale (Ctrl + T). You can use the anchor points to scale the image or enter the values using the toolbar that’s at the top of your canvas. Make sure you remember the values so you can add them to your other images. Double-click on the image to apply the changes and do the same for your other images. Now that the printables are smaller, I want to rearrange them. I will stack them and rotate them so they are both visible. To rotate the images, go to Edit > Transform > Rotate (Ctrl + T). Place your cursor near one of the corners of the image. You’ll notice that the cursor will change into a curved arrow. Just click on your canvas and rotate the image. Double-click on the image to apply the change. You can also rotate the second image in the other direction. Right now, the images are not very realistic. Objects usually have shadows, even thin objects like paper. There are many ways to create shadows. 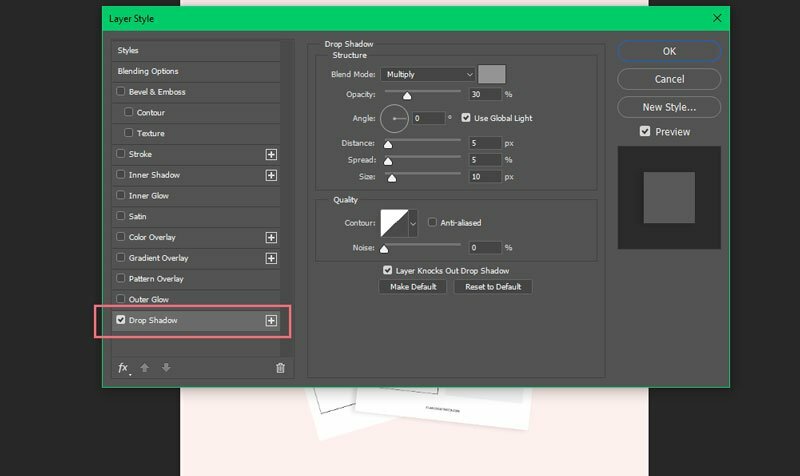 You can use layer styles or you can duplicate your objects and create a shadow manually. Because we have a simple object, I will show you how to use layer styles. 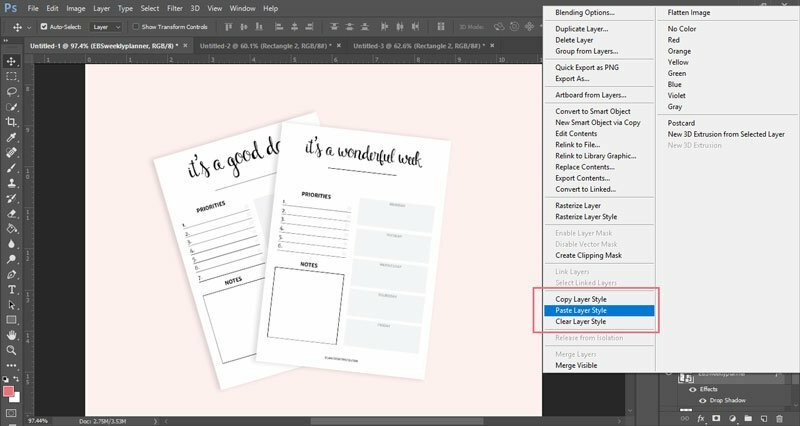 In the Layers panel, double-click on the layer you want to edit. This will open the Layer Style panel. You can also open it from Layer > Layer Style. You can find the Drop Shadow option at the bottom of the Layer Style menu or you can go to Layer > Layer Style > Drop Shadow. Photoshop usually remembers the layer styles. 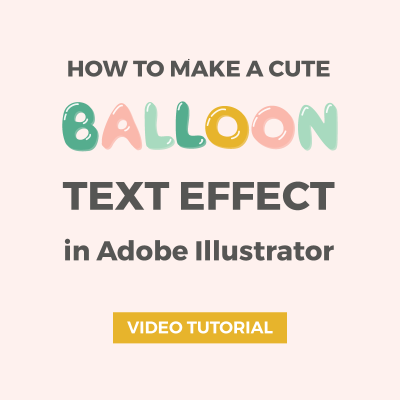 To apply the same effect to your other images, just double-click on the layer you want to edit and check Drop Shadow. If the layer style is different, select the layer that has the effect you want, and right-click on it. 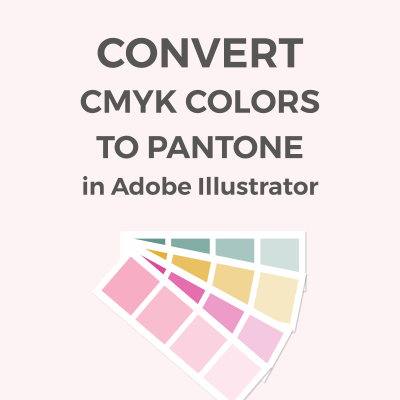 Choose Copy Layer Style and then select the layer you want to apply the effect to. Right-click on it and choose Paste Layer Style. Now that your mockups are done, all you have left to do is add your text using the Type tool. To make it look even more realistic you can add objects like pens, pencils, or flowers. 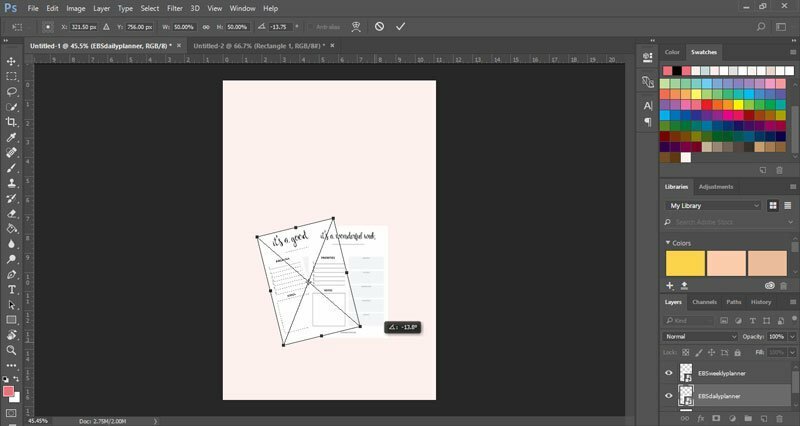 Tip: Save a copy of your mockup as a Photoshop file (.psd). 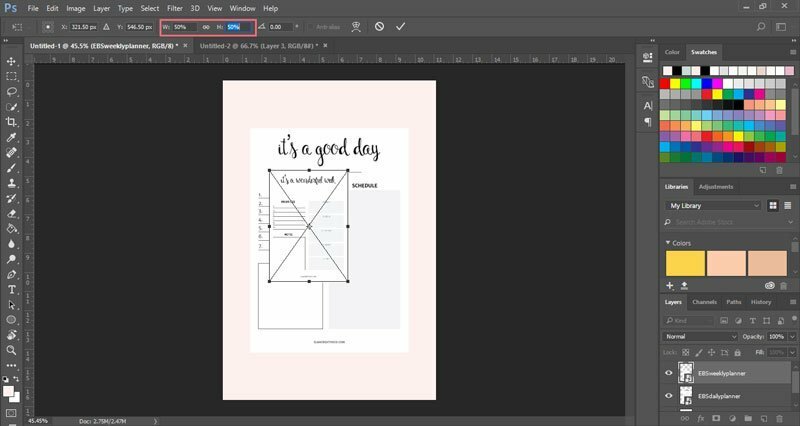 The images are smart objects, so if you want to replace them with other printables, all you have to do is double-click on the image layer. This will open the image in a new document and you can place a new printable there. 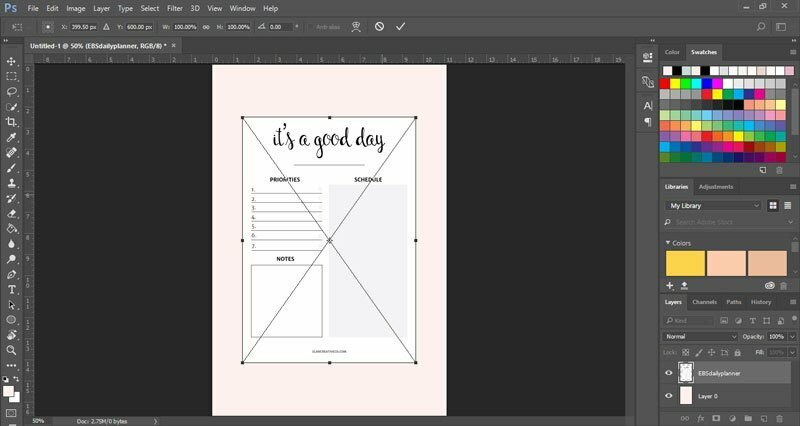 Close and save the document and the new printable will appear in your template. 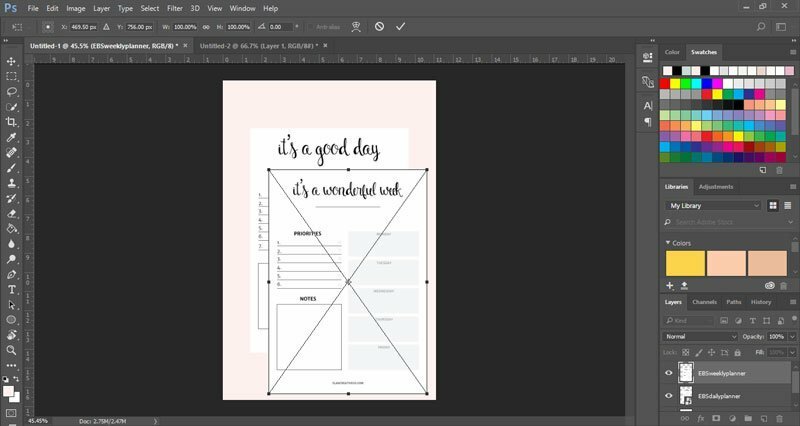 Do you create mockups for your printables in Photoshop? Do you want to learn how to create other mockups? Please let me know in the comments. I searched for Photoshop tutorials on Google for weeks and came across this. This has been one of the best tutorials I have come across in a long time. Thanks for sharing.